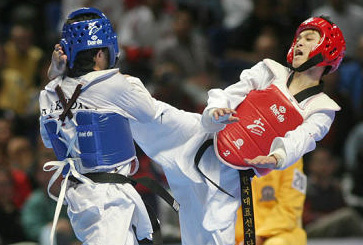 MADRID, Spain (April 16, 2005) – Korea reaffirmed its supremacy in taekwondo as it clinched three gold medals and one bronze on the third day of the 2005 WTF World Taekwondo Championships here today. Korea´s Sin Kyung-hyeon won the gold medal in the women´s over 72kg final match as she knocked out Diaz Iniabelle of Puerto Rico in the first round. Over 10,000 spectators watched taekwondo competitions in a very orderly manner at the Palacio de Deportes in downtown Madrid. Belgium´s Rase Laurence and China´s Liu Riu earned their respective country the bronze medal in the category. In the women´s under 55kg final, Korean Kim Bo-hye edged down Turky´s Marat Zeynep 8-7 to grab the gold medal. The bronze went to Canadian Ladouceur Orphee and Ahmed Helmy Eman of Egypt. In the men´s under 62kg final, Kim Jae-sik of Korea defeated Brazilian Wenceslau Marcio 5-3 for the gold. Turkey´s Dincsalman Kivanc and Israel´s Goldghmidt Llan shared the bronze medal in the same category. Spain´s Montesinos Ruben brushed aside a stiff challenge from Morocco´s Abdelkader Zrouri to earn his country the second gold medal at the ongoing championships, which will conclude tomorrow. As of today, Korea topped other countries in the number of gold medals with seven, followed by host Spain with two. Iran, Brazil, China, Mexico and the United States each won one gold medal. Meanwhile, the World Taekwondo Federation said that it is going all out to ensure fair refereeing and judging at taekwondo competitions. The WTF reaffirmed today that it will put top priority on carrying out all reform recommendations related to refereeing and judging. As part of its efforts, the WTF will present the inaugural "Best Referee Award" to six referees who display the most impartial refereeing at the ongoing 17th WTF World Taekwondo Championships, which kicked off on April 13 for a five-day run at the Palacio de Deportes in downtown Madrid. As a strong display of authority, the WTF´s Board of Arbitration also handed out penalties to two judges and one referee on the first two days of the 2005 WTF World Taekwondo Championships. The Board of Arbitration gave warnings to judges for their poor judging on April 13. One referee was suspended from doing his duty for the rest of the day on April 14. The WTF Reform Committee produced a package of recommendations on refereeing and judging in late February this year, which were unanimously approved by the WTF General Assembly held here on April 12. The WTF will set up an ad-hoc committee soon to finalize the time frame for implementing the recommendations. The proposed new rules on refereeing and judging will apply to all international taekwondo competitions starting next year. "To ensure the most impartial judging, we will do our utmost and all the reform recommendations concerning refereeing and judging will be implemented without fail," said Chungwon Choue, president of the WTF. "I believe that the presentation of the Best Referee Award at the championships will greatly help referees' fair judging and refereeing." Given limited time, the WTF earlier decided to apply only two reform recommendations with regard to competition rules at the ongoing World Taekwondo Championships. The first is the introduction of a golden point system in case of a tied match, and the second is a shortened duration of the men´s competition.